On April 25, 2010 Reported [here], [here] and [here]. 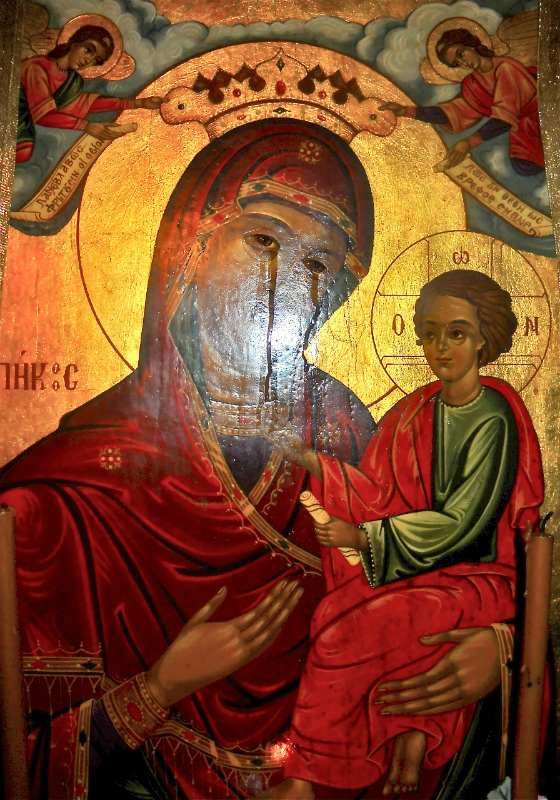 It was confirmed that in the Chapel of St. Nicholas and Ambrose of our Cathedral See in Milan, an Icon of the Theotokos of Bulgarian provenance in the Church began to weep for the second time in two years, in the presence of numerous witnesses. Although the administration of the Metropolia did not report on the previous occurence, not wishing to attract undue speculation concerning such phenomena, the weeping began during a period of heavy visitation, and was noticed by many faithful, and the Bishops and clergy of the Metropolia. Metropolitan Evloghios has officially confirmed that he and the other Bishops were witnesses to the event, while declining to speculate on the meaning of the event, rather calling on all the faithful and clergy to beg for the intercession of the All-Holy and Pure, Blessed and Glorious Lady, the Theotokos and Ever-Virgin Mary, on our behalf. Copies of the Icon are being distributed to the parishes for veneration on this side of the Atlantic.